Use the Gen-Eye for in-line inspection and preventative maintenance of sewer and drain lines, septic tanks, heating and cooling ducts, crawl spaces, chimneys, attics, wells, and much more. The pipeline inspection and location system has everything you need to trouble-shoot 2” through 10” lines. The cameras are built to take a pounding and still transmit pictures so clear you can read the head of a penny. A durable stainless steel body protects the camera from abrasive surfaces like rusty cast iron, while a scratch resistant sapphire lens keeps pictures crystal clear as the camera focuses on objects just inches away. Dimmer controlled LEDS lights give plenty of illumination to show what trouble lies ahead. A specially designed spring and camera shape negotiates bends and slides smoothly through the lines. There are no sharp edges to snag on the way back. With a compact 1.6” x 1.5” profile, both the color camera and black and white cameras give you sharp pictures in lines as small as 3” in diameter. The mini camera can slide through vents, laterals, and laundry drains with ease. Black and white and Color cameras are inter-changeable so upgrade is easy. The push rods use a combination of aircraft type wire rope reinforcement and a tough fiberglass core wrapped in a durable polyethylene sheath. It gives you the strength you need to push out long distances and flexibility at the same time. A shielded coaxial video cable delivers sharp picture quality through long lengths of rod without transmitter interference. Push rods are easily detachable from reels for upgrade or replacement. Mini reels carry up to 200 foot capacity and standard reels carry up to 400 feet. Standard reels also feature eight inch wheels for easy transport. The open cage reel makes it easy to clean the push rod. All metal parts are powder coated safety orange. 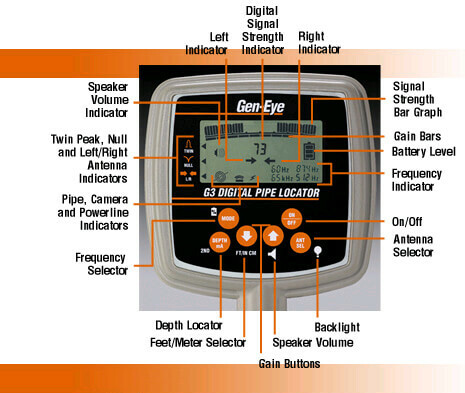 The Gen-Eye Digital Locator lets you know exactly where the problems are. 100 sensitivity levels let you home in on the transmitter's signal. The LCD display panel produces a clear digital readout, as well as a graphic display and an audible tone. It's faster and more precise than analog locators. 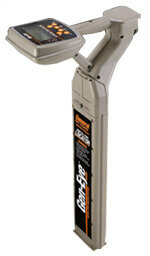 The Gen-Eye Locator lets you locate almost anything underground with its built-in four-way signal finder. You can find the Gen-Eye sewer camera even when it's deep inside cast iron pipe. When you turn on the digital locator, it looks for the 512 hz or 874 hz signal transmitted from the Gen-Eye camera. Complete pipe inspections and location systems will alleviate the guesswork and tell your customers you are ready to do the job. Save time and money. Find out what is self-levelling camera. No need to worry about an expensive TV and DVD bouncing around in your truck. The command module packs a 9" color monitor and DVD combination into a compact, fully padded design - for maximum protection from shock and abuse. 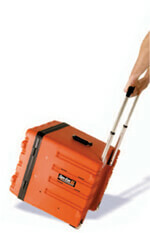 A slide out handle and wheels make it easier to transport from job to job. Built-in dual frequency 3-watt transmitter. 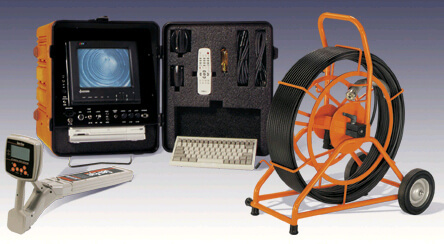 The Gen-Eye GL offers a DVD recorder to provide a crisp picture with a jetter free freeze frame, allowing you to better analyze any problem. A VCR option is also available. A separate 9" industrial color monitor provides you with a sharp picture. The Mini-Monitor package fits in a smaller space and a smaller budget. The compact, light weight Mini-Monitor weighs just 18 lbs. And it has some of the features of the full size Command Module. Combine the Mini-Monitor with the Mini-Reel for 2” to 4’ lines or the Standard Reel for 3” to 10” lines and get a very economical package. Mini Color Camera, Mini Monitor Color?? The Mini-Monitor package fits in a smaller space and a smaller budget. The compact, light weight Mini-Monitor weighs just 18 lbs. And it has some of the features of the full size Command Module. Combine the Mini-Monitor with the Mini-Reel for 2" to 4' lines or the Standard Reel for 3" to 10" lines and get a very economical package. Have you ever dug up the flower bed and driveway only to find the problem was somewhere else? Mistakes like these cost time, money, and reputation. And when you find the problem, do you need a shovel - or a backhoe? The Gen-Eye Pipe Locator uses high tech digital technology to tell you exactly where the pipe is and how deep, down to the inch. No time-consuming triangulation required. With the push of a button, you can locate cast iron pipe to a depth of 10 ft. and plastic and clay pipe to 20 ft.
digital depth indicator, battery status. Self-leveling color sewer camera that’s just 1.375” in diameter, standard color camera with 16 LED’s, or a black and white camera in a stainless steel housing. The on-screen titler keyboard is virtually indestructible. It’s impervious to water, dirty hands and grime from the field. You get up to eight pages of text to add your company name and job location to each video you make. Internal microphone and on/off switch? ?lets you add commentary to your videos. Lets you keep track of how much push rod you’ve fed into the line. Internal 512 Hz transmitter, picture inverter, dimmer control, panel mount fuses, and trap skid. All the electronics are protected in a sturdy case with wheels, telescoping handle, and a tilt stand for convenient viewing, transport and maneuverability. The standard reel holds up to 400 ft. of push rod on a sturdy frame and takes up little space in your truck. Eight inch wheels ensure easy transport to and from the job. The mini reel carries up to 200 ft. of push rod in a compact frame for easy handling without taking up too much room in your truck. Skids keep the sewer camera centered in the pipe for a better view, while reducing drag on longer runs. Standard systems include both 3" and 6" trap skids that protect the camera from abrasion as it slides through cast iron traps. Optional 3-in-1 skid set for 4", 6" and 8" lines, and Universal Roller Skid for 6" to 12" lines are also available. Line Capacity 3" to 10" 3" to 10" 3" to 10" 2" to 4" 2" to 4"
Reel Capacity 200, 300 or 400 ft. 200, 300 or 400 ft. 200, 300 or 400 ft. 100 or 200 ft. 100 or 200 ft. Camera Dimensions 1.375" D x 2.312" Long 1.375" D x 1.85" Long 1.2" D x 1.7" Long 1" D x 1.8" 3/4" D x 1"
What is "self leveling" camera? Self-leveling camera head is used for a consistently upright picture. It is weighted so no matter how the camera turns in the pipe it will flip into the proper position for camera view. This is achieved by bearings that add weight in the camera drawing it using gravity to adjust for upright view on the monitor. Tungsten weighting system produces reliable, consistently upright picture. Patent pending Teflon bearing and slip ring design has few moving parts for increased reliability. AC/DC switchable. Built-in 12 volt DC power inverter !?! Battery vs. electric? Allow user to operate in the field with truck power alone. Unit comes with AC and DC wires and storage for both. Operator can use 12V source in vehicle or switch to AC power using alternate plug. For use without self-leveling camera, at a push of a button, the screens image can be moved to upright position for easier viewing, puts picture right side up.